Hospital food cooked with fresh local ingredients could put hundreds of millions of pounds back into the NHS, one hospital trust has said. Catering managers at Nottingham City Hospital and the Queen's Medical Centre have switched to such a menu. The trust says the daily plate saving is £2.50 per patient. Trust catering manager John Hughes said if replicated across the East Midlands the policy would save £6m a year - or £400m if adopted throughout the NHS. The food travels less distance than many of the 7,000 patients who choose from the menu each day. The hospital contract is also supporting dozens of local farmers and has saved a number from going under. In its first year the farm-to-plate scheme has put a million pounds into the local economy and that is likely to double over the next 12 months. Mr Hughes says the idea of getting his beef from down the road rather than South America sounded good but he thought it would be too expensive. He was also concerned there would not be enough fresh local produce to fill his cupboards. "I was happy to be proved wrong on both counts," he said. "This was one of the tough decisions I think we'd be cheered to the rafters for taking." "It doesn't actually cost any more and you are actually going to invest in local communities and the local suppliers you want to develop. On top of that it's actually going to save the NHS millions of pounds a year." Ninety per cent of the fresh food the hospitals use comes from the East Midlands and it has a Soil Association award for its work from Prince Charles. Since his team took over running the kitchen from private contractors, Mr Hughes says they now have more control over quality and price. Five miles up the road from the hospital, in the village of Nuthall, you will find Michael Hatton's pig farm. The business was on its knees before getting in with the hospital, something that would not have happened if he had approached them on his own. He is now part of a network of small farmers who send their meat via a regional hub to the hospital and other big buyers. The same things happen with many of the hospital's fresh vegetable suppliers. As a result Mr Hatton has just turned a profit for the first time in 10 years. "I was almost ready to call it a day, things were very, very difficult," he said. "There were basically four jobs on the line here, but with this new contract we're getting margins being passed down to us, which makes all the difference, and we can actually make a living from it now." The total journey from farm to plate is no more than 30 miles for Hatton's pigs. 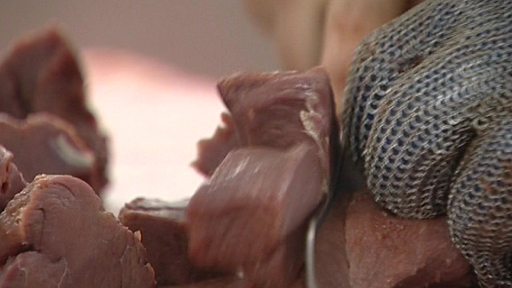 After slaughter in Chesterfield, they stop off for processing at Owen Taylor's near Alfreton in Derbyshire. Managing director Richard Taylor says the 80-year-old business and its network of local farmers are a rare breed today. "It has to be the way forward, but sadly there aren't many of us about that could do this sort of operation and have the control from farm to plate." Mr Taylor added: "It would be good to see more set-ups like this across the country and more controls put in to make sure it happens. "That would mean big business can go to people like us and say 'I want X,Y and Z' and get it." In the huge hospital kitchen they stir bath-sized soup vats with paddles rather than spoons. There is plenty of stainless steel clanking about as staff get a fleet of hot trolleys ready to roll onto the wards three times a day. Running out is not an option. Putting their trust in the local supply chain is making the weekly shop go further in the kitchen, while actually saving 150,000 food miles a year and a lot of money.